The wife of Zimbabwean dictator Robert Mugabe is facing legal action after being accused of attacking a young woman at a party in South Africa. 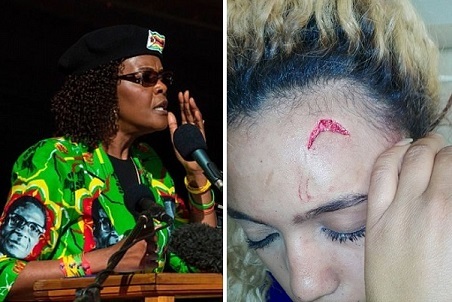 Grace Mugabe, 52, allegedly beat Gabriella Engels, 20, with an extension cord after finding her in a hotel with her sons Robert Mugabe Jr, 25, and Chatunga Mugabe, 21, at a hotel. she had been ‘partying’ with her sons. The model, from Johannesburg, claimed Mrs Mugabe’s guards watched on and did nothing to stop the violence, according to Zimbabwe news website Bulawayo 24. Miss Engels mother Debbie also wrote on social media that her daughter would be going to the police over the incident. Mr Mugabe’s sons were previously living in Dubai but allegedly relocated to South Africa earlier this year over ‘security concerns’ amid rumours of drug and alcohol use. They were also reportedly evicted from a luxury apartment in Johannesburg after a ‘drunken brawl’.